The Panasonic AG-UX90 4K Premium Professional Camcorder records DCI 4K (cinema 4K) at 24p, UHD 4K at up to 60p, and FHD up to 120p (when set to 59.94Hz standard). The camera is switchable between the 59.94 and 50Hz frame format, which is analogous to NTSC and PAL. This allows the camcorder to integrate seamlessly with a wide range of current broadcast video systems in place around the world. Featuring an integrated 20x optical zoom lens and a 1" type sensor, the camera records in DCI 4K, UHD, and HD in MOV, MP4. The camera is also capable of recording HD in the AVCHD format. The 16-axis color correction functionality enables precise color adjustment not normally available on a camcorder. Panasonic Optical TechnologyThe integrated Leica Dicomar 20x zoom lens was designed specifically for professional HD video production and features a 24mm equivalent focal length on the wide end of the zoom when recording DCI 4K for a 24-480mm (35mm equivalent) zoom range. The lens combines four lens groups and incorporates Optical Image Stabilization (OIS) and when shooting in HD it supports 5-Axis Hybrid image stabilization. Intelligent ZoomThe i.Zoom function increases the zoom range in FHD to 30x while maintaining highresolution. When the zoom reaches the 20x optical zoom limit it switches seamlessly to i.Zoom. Digital ZoomThe AG-UX180 is equipped with 2x, 5x and 10x digital zoom. Using the 20x optical zoom and i.Zoom together, the digital zoom will extend the range to 60, 150, and 300x without affecting exposure. Manual Control RingsThree manual rings, mechanical (cam-driven) zoom, focus, and iris, allow you to operate as if you've got an interchangeable-lens camcorder, able to adjust either focus, zoom, or iris directly without having to select a control surface. Intelligent Auto FocusFeatures high-speed focusing, high-precision focus tracking, and high-focusing stability. Customizable Auto FocusYou can adjust the AF speed, sensitivity and area width to fine tune the AF functionality to your tastes or the needs of the shot. The speed can be set from 1 to 7, the higher the number the faster the AF. The sensitivity likewise can be adjusted in steps from 1 to 10, with the higher value corresponding to being able to track faster-moving subjects. The adjustable area width can be adjusted to fine tune the auto focus selection. 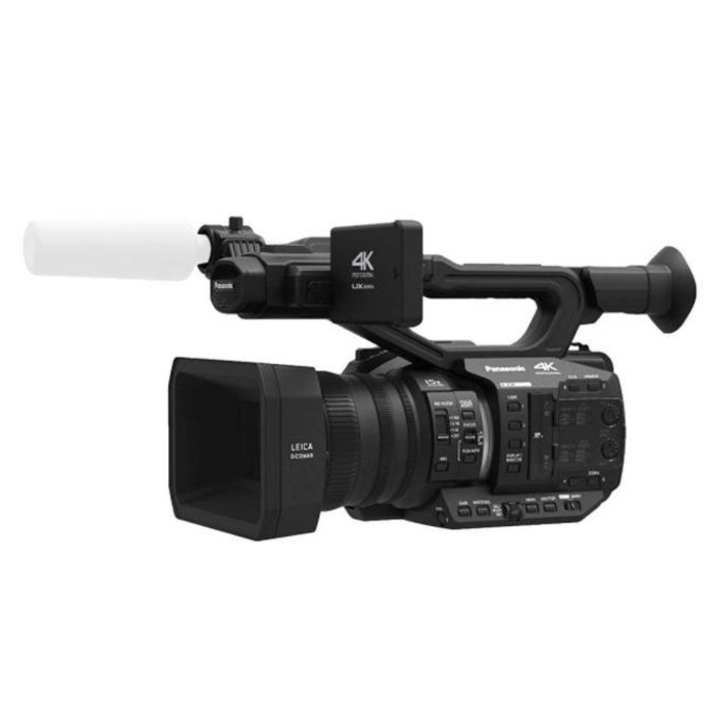 4K UX Series Professional CamcorderThe AG-UX180 is the premium model in the 4K UX Professional Camcorder Series, featuring a 1” (effective size) high-sensitivity MOS sensor and the industry’s widest angle zoom lens (20x to 24mm at the widest angle). With its extensive focus assist features, multiple recording formats in 4K and HD, as well as precise image adjustment functions, the highly-affordable UX180 is the pro camcorder you’ve been waiting for to upgrade to 4K acquisition.